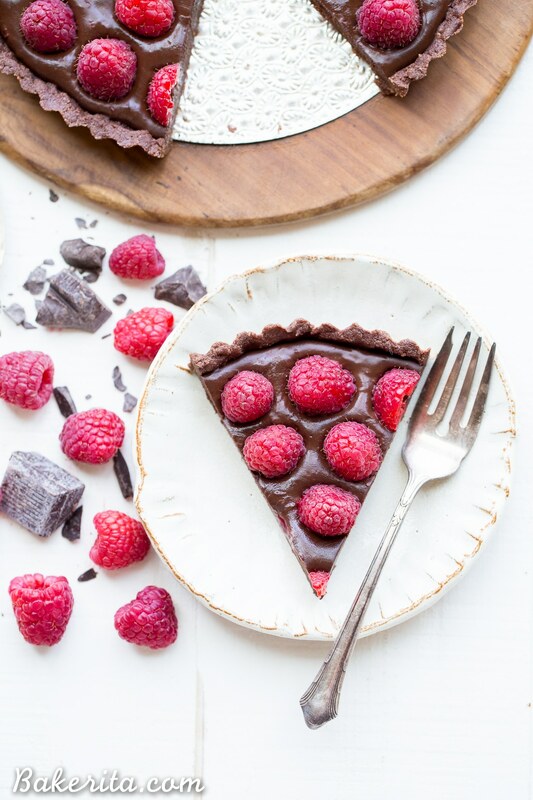 This No-Bake Raspberry Chocolate Tart comes together in just ten minutes! 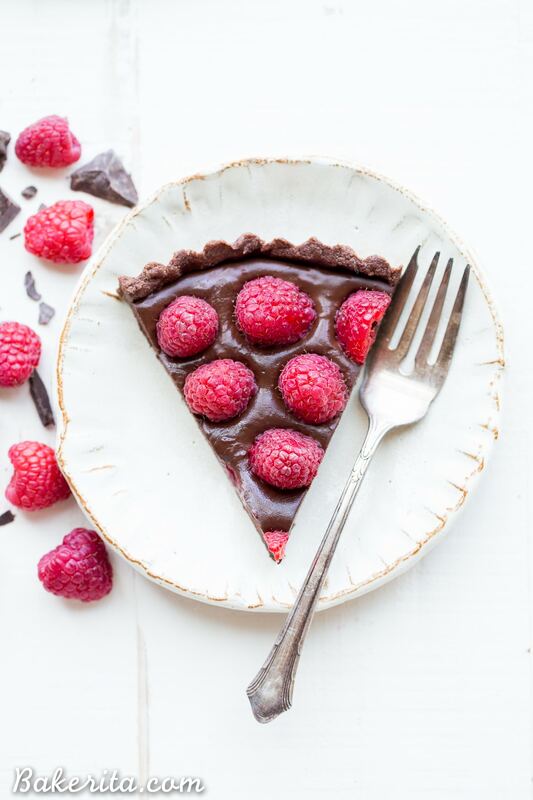 The no-bake chocolate crust is filled with vegan chocolate ganache and topped with fresh raspberries for a decadent, guilt-free treat. **2017 Update** Who else loves chocolate and raspberries?! They’re such a perfect combination – especially in this super rich and chocolatey tart. The raspberries add a perfect burst of freshness to the ganache filling. This recipe has been a favorite since it was originally posted in June 2015, and it was time for the photos to have a bit of an update. The recipe, of course, was kept as-is so you all can keep enjoying it :) the original post is below, as well. Hope you love it! One of my absolute favorite parts about summertime is the berries. There’s nothing like a fresh, ripe strawberry that has juice dripping down your chin, or being able to pop sweet and tart raspberries in your mouth. I love all of them, and as they come into season and get sweeter, brighter, and more affordable, they become a staple of my summer diet. While I love to devour them alone, enjoying their sweetness and freshness, I also love to make (and eat) berry tarts. If you’ve been around Bakerita for a while…you’ve probably seen some of my favorites. 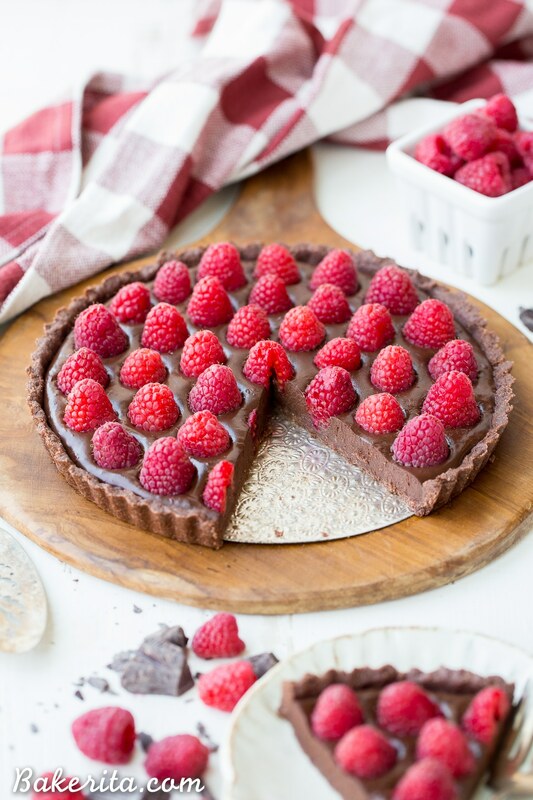 This Chocolate Berry Tart is one my ultimate favorites (and it’s Paleo and vegan!) and this Blueberry Crisp Tart with Oatmeal Crust is comforting and delicious. 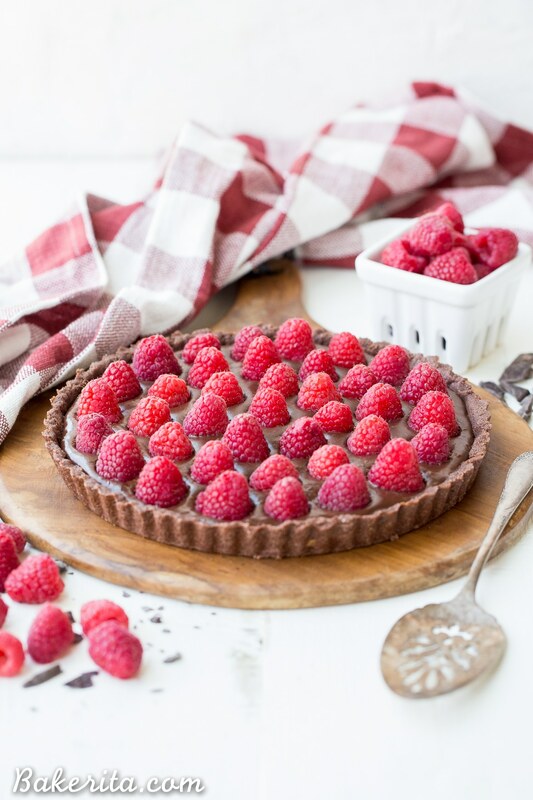 This No-Bake Chocolate Raspberry Tart though, it might take the cake. In addition to being super easy, it’s also healthy – it’s gluten-free, refined sugar-free, vegan, and Paleo-friendly! Oh, and you don’t even have to turn on your oven. It’s perfect for those hot summer days when you can’t even bear the thought of adding more heat to your house. The tart crust is simple and chocolatey. It’s made with almond flour and cocoa powder, and requires just a quick stir and press into the pan before it’s ready to go. The chocolate filling is just as easy to make. Just bring some coconut milk (full fat!) to a boil, pour it over your chocolate, let it sit for a sec, add some raspberry preserves, and stir. Pour into the crust, and boom – you’re almost done. After you finish the chocolate, garnish with some gorgeous, fresh raspberries! I arranged mine simply, packing the raspberries together for maximum raspberry flavor. I love Driscoll’s raspberries (and all of their berries) because they’re always sweet and always delicious. They add the perfect touch of fruity sweetness to this dessert. This healthy, fruity dessert is sure to be a favorite and even though it’s healthy, you totally won’t get the looks people give when they hear the words “healthy” and “dessert” next to each other. This tart was gone SO quickly in my house. Like, record breaking quick, because it was so darn good and the fruit added just the amount of freshness needed to be able to devour a slice. Lightly grease a 9-inch pan with a removable bottom with coconut oil. In a bowl, combine all of the ingredients for the crust and stir together. Press evenly into the prepared tart pan; set aside. Place finely chopped chocolate in a large bowl. In a small saucepan, bring coconut milk just to a boil. Pour hot coconut milk over chocolate and let stand 1 minute, then stir until smooth and creamy. Stir in raspberry preserves. Pour the filling into the prepared crust. Garnish the top with raspberries. Store all leftovers in an airtight container in the refrigerator. Can you clarify what raspberry preserves are please – do you mean jam? Hi Natalie, yes, it’s jam, but preserves tend to have less sugar than jam, or be entirely fruit-sweetened, which is what I look for. I either make it myself or buy it at Trader Joe’s! Thanks so much, Lauren! I hope you try and love the tart :) it got devoured by my friends who have no dietary restrictions at all! Doesn’t bittersweet chocolate have milk products in it? Hi Staci – all true dark chocolate has no dairy in it! This tart is gorgeous, Rachel! Your berry tarts are always stunning! Omg, this tart is so perfect! Look at those gorgeous raspberries. And all that chocolate! I feel like I say this all the time, but I am always so impressed with your healthy desserts. :) Pinned! I love that this is vegan and sugar free and that you used 200% fruit preserves to sweeten the filling! Awesome :) Pinned! This is, hands down, the best chocolate torte I’ve ever tasted -and it doesn’t even taste dairy and gluten free! Giiiiirl, this tart is GORG!!! And then it’s paleo, vegan and GF? what kind of amazing wizardry is going on in that kitchen of yours?! I want some of it! Pinned! Um, just stunning! And no-bake?!?! LOVE! Agreed! All the berries are one of my favorite parts about summer! This tart looks fantastic! I love a great no-bake summer berry dessert. The flavors of fresh fruit during late spring/early summer are so perfect that no baking is required to fully enjoy them. Beautiful flavor + less work = win-win! This tart is gorgeous! This is one seriously gorgeous tart! I can’t believe it’s Paleo and GF, looks absolutely amazing. And no-bake too! Awesome! Looks delicious! Keep up the great work! Unfortunately, I only have all purpose and whole wheat flour…Can I use those as substitutions? I have previously tried making the mango tart but the crust did not stick together (it fell apart as I took it out of the pan). It looks like this recipe has more coconut oil which may help in holding it together. Any suggestions? Hi Clara. Sorry for the delayed response! I just got back from vacation. I’m sorry you had trouble with the mango tart crust! I’ve made the recipe many times with success – could it be that you’re using a very course almond flour? That could cause issues with crumbling. 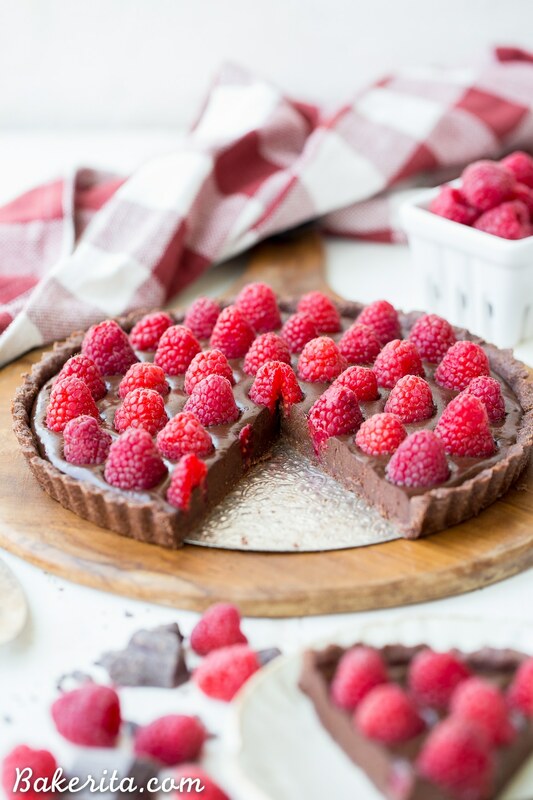 I haven’t tried using traditional wheat flours in this case, so you may just want to substitute a different chocolate tart crust that uses those types of flours. Hope this helps! I can’t believe something this gorgeous can be so fast, easy, and vegan! I LOVE this recipe! (In fact, I’m making it again already!) I was just wondering, how thick was your filling? The first time I made it, it was fairly runny and I found it was better after a night in the fridge. Any recommendations? Thanks for the great recipe though, it’s a keeper! Thank you so much for this yummy recipe , I recently had to change my whole diet and am missing chocolate coz I cannot or should not eat sugar but I have question if I cannot find coconut milk , can I use almond milk as substitute ? Hi Wedad! Almond milk should work, but it might be a little bit thinner and not firm up quite as much. Definitely keep the tart refrigerated, especially if you’re using almond milk :) hope you enjoy the tart!! this is not sugar free, bittersweet chocolate? there is sugar in that, there is sugar in raspberries, almond flour in high in cals and so id coconut milk, coconut oil and maple syrup is sugar. this is delish I’m sure, its ingredients are natural and full of nutrition however this is a high calorie treat and if you eat it you need to be considerate of it’s high calorie content just like any other cake. I love this recipe, but cmon, wake up & learn something about nutrition so you don’t give yourself or your kids diabetes. Hi T. I didn’t claim this recipe is low in calories or that it is entirely sugar free, but it is free of refined sugars. This isn’t meant to be a health food eaten on a daily basis, but rather a treat for those who can’t indulge in “traditional” baked goods due to dietary restrictions or other eating habits. Can I substitute almond flour maybe with gluten free oat flour? I haven’t tried it but that should be just fine. Actually, calories count far less than hormones do in weight loss. Most of the sugars in this or natural sugars which are not process the same way as table sugar. Check out intermittent fasting. It not only helps the body burn fat, but it heals the body as well. Which is far more effective than a calories and/calories out diet. Thank you for this awesome recipe! I made your recipe and wrote a blog about it! Can you use unsweetened dark chocolate in place of bittersweet chocolate? Want to make this for a friend who can’t have sugar. Hi Stephanie! You can, but be sure to add some stevia or another sweetener or the tart will be far too bitter – unsweetened chocolate is pretty much inedible without any sweetener added. Just add stevia drops to taste! Enjoy. Is the coconut milk sweetened or unsweetened? I always use unsweetened canned coconut milk. Hi Meredith, I’m so sorry you had troubles! That’s so odd. The most likely issue I thought of is the coconut milk – did you use full fat canned coconut milk? It’s much thicker than the coconut milk that can be found in the refrigerated section now, and could’ve caused it to be runny. The filling is essentially a ganache, so the thickness can be adjusted pretty easily by adding additional chocolate or reducing the amount of liquid. I hope this helps! Again, my apologies you had this issue. Happy New Year! hi! love this recipe :)r. i was wondering – can coconut flour substitute the almond flour? or is coconut flour only suitable for baked recipes? thanks so much! Hi Kelan – coconut flour is much more absorbent than almond flour, so it probably would make the crust way too dry! You could substitute any other nut flour, but I wouldn’t recommend coconut flour. Hey! This looks fantastic. I was wondering if I could substitute the coconut milk for Greek yogurt! I’m not a fan of the taste of coconut milk. I’m looking forwards to making this! Could I add lime juice instead of the preserves as well? Thanks. Also, you can definitely add some lime juice! Enjoy. Hi Angie, I don’t think Greek yogurt would substitute very well since you have to heat it up, but you could sub an equal amount of heavy cream or 1/3 cup almond milk. Enjoy! How do I make the raspberry preserves? Or is this something I buy? Hi Leanne. I purchased “100% fruit” fruit preserves for this recipe, though you could certainly make some yourself if you wanted. This tart looks delicious and I can’t wait to try it myself! Is it best to make this tart the day you plan on eating or can it be made ahead and kept in the refrigerator until you get ready to serve? Hi Traci! I would recommend making it the day your serving for the best result, but if you want to make it ahead of time, I would recommend just holding off on adding the berries on top until right before serving so they’re the freshest. Enjoy! Can I sub condensed milk for the coconut milk? Hi Nancy, I suppose you could, but it will add a lot of sweetness so you may want to use a very dark chocolate. Enjoy! There is a VERY important last step to this recipe that I highly recommend you add – REFRIGERATE! It is completely missing from your recipe!!!! I had no idea that I was supposed to refrigerate this after making it, and even though I only had 2 hours between making it and serving it, I didn’t refrigerate it at all and it was a total runny disaster. For people unfamiliar with using coconut oil, we don’t know that it needs to solidify, I asked my friends and they told me I should have frozen the crust a bit before adding the chocolate/coconut oil and then refrigerate the whole thing. PLEASE update your recipe! Thank you! Hi Kristen – thank you for pointing out my mistake! I can’t believe that the recipe didn’t have instructions to refrigerate, I think the last line of instruction may have been deleted actually. I’m so sorry! I updated it now, because yes, it definitely needs to be refrigerated before it can even be cut. I just made this today after work! It’s super easy, I added a few ounces more chocolate and a tiny bit more coconut milk, I didn’t do a crust and after an hour and twenty minutes in the fridge it turned out perfect! Thanks for the yummy, easy dessert inspiration! Hi Colette, yes I used a tart pan with a removable bottom and always do – makes it much easier to cut! Here’s an affiliate link to the pan I usually use: http://amzn.to/1U9SAaP. Hope this answers your question! Hello! I just stumbled over this recipe on pinterest and am dying to try it! It looks so delicious and I love the chocolate/raspberry combination. However, I live in Switzerland and have never seen raspberry preserves made of 100% raspberries in a store – just regular jam (with refined sugar) or jam with 55% raspberries and sweetend with “fruit sweetener” (i.e. from apples or grapes) but no refined sugar. Is this what consider 100% fruit? If not so, do you have a recipe to make the kind of preserves you mean? …and: can I use ground almonds instead of almond flour? Yes, you can! However, depending on how finely ground (or not) the flour is though, the crust may be a bit more crumbly. Yes, you can! However, depending on how finely ground (or not) your ground almonds are though, the crust may be a bit more crumbly. Hi Flurina! So glad you like the recipe. We do have preserves here in the States that are made of just fruit. I don’t have a recipe for one, because I do usually just buy it. I imagine the refined sugar free, fruit-sweetened jam you mentioned would be pretty similar and work well in this recipe. Enjoy, and I’m wishing I could come visit you, haha! Today, I finally found time to make the tart – and: it was delicious! Even with Swiss ingredients :-). I, my husband and kids (age 3 & 5), we all LOVED it (my husband was quite sceptical before tasting it because so far I haven’t had any sucess with vegan dessert recipies…). It’s very rich and yummy, I will definitely make it again! Thank you so much! By the way, I used 85% chocolate. Hi, I love chocolate and recipes without refined sugar, but noticed that there’s no sweetener of any kind in the filling, and that you use bittersweet chocolate. I don’t like really bittersweet chocolate that’s more bitter than sweet, so was wondering what percentage of chocolate did you use in this recipe? Does it come out tasting sweet without any sweetener like maple syrup, etc.? Thanks! Hi Joanne. Since there isn’t added sweetener to the filling, I would recommend using the kind of chocolate you enjoy. I believe I used around 70% for this recipe, but if you prefer more semi-sweet, you could go with a 55-60% chocolate. Enjoy! Hi Rachel, I just realized that the raspberry preserves in the recipe might have some added sugar or sweetener in it.. or are they only fruit without sweetener? I love chocolate, but would like to avoid other ingredients that add more sugar. Thanks! Hi Joanne! The kind I used was 100% fruit, so it didn’t have any added sugar – I recommend looking for the same to keep it free of refined sugars. If you’re concerned or can’t find preserves made with 100% fruit, you can leave the preserves out without any issues, or just crush up some fresh raspberries as an alternative. Hope this helps! Hi Rachel, I’m just now getting around to making this for Thanksgiving, and have a question about the raspberries. The raspberries on top of your tart look so good, but whenever I wash raspberries, they get mushy. How did you keep the raspberries looking so good? Did you wash them first? Also, how high is the chocolate section of the tart? Hi Joanne! I try to wash them in a big colander and use the light “shower” setting on my faucet to keep the water from pounding them too hard. The chocolate is probably about an inch thick. It’s a very rich tart, so a little goes a long way. Hope this helps! I made this yesterday for my aunt- she’s celiac + lactose intolerant, pretty hard to find recipes that taste great and won’t make her sick! But this was an absolute success! I used reduced sugar/added fruit jam that I heat up to make a little more runny to mix (had no access to raspberry preserves and didn’t have the time to make them) It worked really well, and I feel like it added a bit extra structure with the pectin. Great recipe, definitely getting saved! So glad to hear it was a hit that everyone could enjoy, Melissa! Thanks for reporting back :) I love hearing about your successes! Heavenly! I haven’t had anything this amazing since being diagnosed with Celiacs a year ago. With graduation parties and weddings galore this time of year, I’ve been CRAVING something really decadent. This was exactly what I’ve been searching for. THANK YOU! I made it exactly as described and found that it took several hours for the center to be more firm, but here in Arizona the temp outside is 115 – so that is to be expected. I love the undertones of raspberry balanced by the darkest of chocolate, and I’m not even a dark chocolate fan. Seriously – THANK YOU! This is my new favorite indulgence – NO BAKE makes it an anytime of the year pleasure! YUMMY! This is what I requested from my mom for my birthday cake and it turned out so absolutely delicious that it will be my new go- to dessert. She said it was crazy easy too! Thanks for providing a decadent paleo recipe! Hi Jenn, yay I’m so happy you loved it!! Hope you had a wonderful birthday :) thanks for letting me know your thoughts! My friend made this for a birthday party this weekend and it blew my mind! It was so rich, but not too dense. Decadent but not too sweet. Pleased the non-vegans (who didn’t know any better). I will definitely be making this in the future. Thank you for the great recipe. Highly recommend! So happy to hear that, Claire!! Thanks for that sharing with me :) hope you love it again and again! My wife wants to know where this recipe has been all her life!!!! I made this last night but the filling didnt set. So when I took the ring off the filling kinda oozed out. Especially when I cut it. Was that supposed to happen? It was still delicious but kinda messy. Hi Nadya – how odd! Did you chill the tart in the refrigerator? Also, if your coconut milk wasn’t of the canned, full-fat variety, it may have been too thin which could have made the filling thinner. Hope this helps resolve the issue! I made this twice this past weekend and an already thinking of an excuse to make it again, it was FANTASTIC! The first batch I didn’t realize I was using a ten inch pan (springform…and I forgot to press the crust up the sides, gah! ), so by the time I poured the filling in it sort of looked like a pancake. Since I was making it for a friend’s birthday I had to do it right, so I popped the flat one in the fridge and started over. Luckily this is such a quick recipe that staying over wasn’t a big deal, and most of the ingredients come in containers that allow for a few batches. The second time I used a nine inch pie pan (no removable bottom, which isn’t a big deal overall), and bc I was out of fridge space I popped out in the freezer for a hour and a half before serving. Perfection!! Everyone loved it, and the entire thing was gone in minutes. Luckily I had the other flat batch in the fridge for later, which tasted totally great. The one thing I would mention if people are having trouble finding ingredients is the almond flour was found in the health food section of our grocery store, and the full fat canned coconut milk was in the Asian food aisle. Thanks so much for this recipe, it is a new favorite! Perfect for summer! So happy to hear it was a success, Erin! And you even got an extra, just for you ;) haha. Thanks for sharing your experience and the tips. Hi, you mentioned almond flour in your list of ingredients. Is this actual flour and not grounded almonds? I noticed that the crust is not cooked so thought I’d check on the almond flour front. Thank you! Your recipe made/saved my husband’s birthday! The oven stopped working so I couldn’t bake a cake…. THIS was better. He loved it!! Thanks so much! Truly delicious! 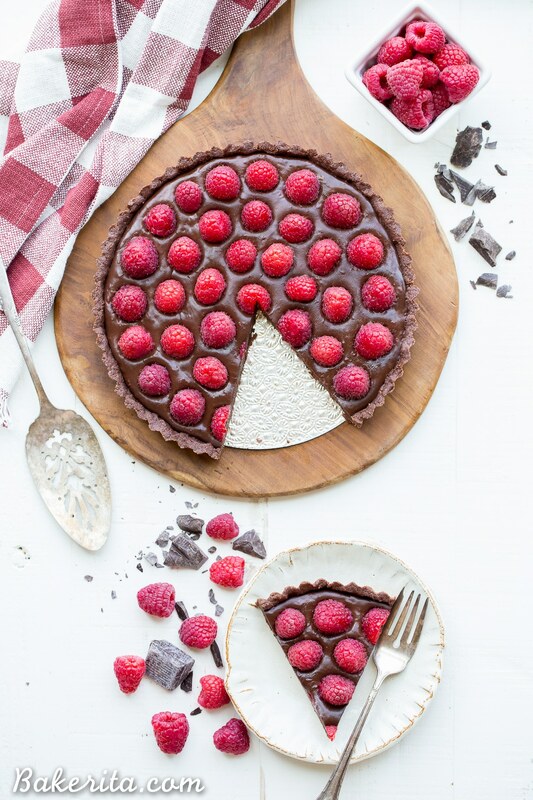 I really want to make this beautiful tart, but I can only find a 10″ pan (not enough time to order one). Do you think it will still work? Any recommendations for adjustments? 9″ seems hard td to find. Hi Alicia. It should be fine in a 10″ pan – just might be a little bit thinner. Enjoy! i am making this for some gluten/dairy free, and vegan friends and cant find 100% raspberry preserves. can i just use regular preserves? or is there something in it that makes it not gluten/dairy free or vegan? also, i found organic, reduced sugar raspberry preserves at trader joe’s and the ingredients are organic raspberries, organic sugar, water, fruit pectin, calcium chloride, and citric acid. is this an ok product to use? Hi Kristen, that should work fine! Any kind of preserves will do the trick – I just like the fruit sweetened kind because it’s sweetened with apple juice concentrate instead of sugar. Hope you and your friends enjoy! Hey! I was wondering if I could use any other oil instead of coconut oil for the crust? The recipe looks delicious! Hmm I haven’t tried it, but butter would work! A liquid oil would probably make the crust too oily though, since it wouldn’t set up the way the coconut oil does. Hope this helps! I found your recipe while researching vegan no-bake dessert options for Christmas lunch last year. The tart was such a success that I have come back and made it about 5 more times since then! A new favourite in my family – and so easy to prepare. No bake desserts are an absolute lifesaver for a sweet tooth like me over summer. Thank you! I made this for Mother’s Day and it was a HUGE hit! I used regular (sugar-added) raspberry jam because it’s what I had, doubled the filling as some others mentioned, topped it with strawberries, and it turned out perfect. It was decadent, just sweet enough, rich and creamy, DELICIOUS! So glad it was a hit, Carie! Thanks so much for your feedback. Recipe doesn’t work with the increments of the crust, complete dust, and half the portion as pictured using the same size pan. Wouldn’t recommend. Hi Claire, hmm – I’m sorry you had troubles. I used these exact measurements the other day with no issues. Is it possible you packed the flour or cocoa powder too tightly? I’m not sure why you would have had these issues. Feel free to reach out if you need help troubleshooting. I made it for my vegan friend’s birthday. After it set in the fridge the coconut oil rose to the top and solidified on the top. I know it id’s just coconut oil, but it doesn’t look as appetizing as i pictured. Got any tips or tricks to prevent this? Hi Tara, sorry for your trouble. Did you put coconut oil in the filling, or are you referring to coconut oil rising to the top of the crust? There shouldn’t be any in the filling and it would be super odd for it to go from the crust, through the filling, to the top of the tart…if you can provide a bit more explanation I can help you troubleshoot what went wrong. Hi i made this last night and like Tara, there were so solidified coconut oil patches on the filling which doesn’t look appetizing. I only used the coconut oil on the crust n not in the filling so can’t figure out why it happened. Any ideas? Huh, that’s super weird. Was the crust super oily when you pressed it in and poured the filling on top? The only thing I can think of is if there was excess coconut oil on top of the crust and when you poured on the ganache it got pushed to the top…I think throwing the crust in the fridge or freezer before adding the chocolate ganache could’ve prevented this. I’ve never had anything remotely similar to this happen to me so I’m just hypothesizing – I’m truly not sure how that happened since there isn’t any coconut oil in the ganache! Sorry you had trouble. Maybe try using a hair dryer to melt the coconut oil on top and swirl it in a bit if you don’t like the way it looks? Wow! This recipe was perfect. So simple and quick yet tasted amazing. I’d be very happy if I had this in a restaurant. This will be a regular dessert in our house! I used coconut cream instead of milk and used mostly the thick part (not much of the watery part). My husband has made me a total of 3 birthday cakes in the 20 years we’ve been together. This year (2017) he found this recipe and made it for me. It was HANDS DOWN the BEST chocolate dessert ever! Sneaky me was able to track down the recipe (thank you google)! what are fruit preserves? Never heard of that? I guess it’s raspberry jam? Will have to hunt that down. They are similar to jam, but usually made without refined sugars (typically sweetened with fruit juice instead). So happy to hear that, Anna! Thanks for the feedback. I’ve just made the crust and it’s very runny. There’s no way I can get it up the sides of the round cake pan? Hmmm… did I muck up the amounts? I’ll try adding more almond flour…. Oh no! I’d try adding more almond flour and letting it firm up in the fridge for a little bit. Hope that helped! Amazing! This was a real hit amongst vegans and anti-vegans! I tweaked it and added coconut shavings to the top instead of fresh raspberries and a few drops of natural coconut essence to the filling. So it was more of a dark chocolate and coconut pie. Yummo! So thrilled to hear that you enjoyed the pie, the coconut twist sounds delicious! Thanks for your feedback. Is the 1/4 coconut oil measured before or after you melt? It’s slightly more accurate to measure after melting! I made it for my family Christmas Party for 3 ppl either vegan or gluten free. They loved it! As someone withouf any dietary restrictions I was a little nervous how it would taste, but I really liked it! I made it exactly as written only I just put into a pie pan and served it from there. I also made it the day before and because I was nervous about the fresh raspberry’s “melting” on top of the pie, I froze it immediately after making then just put it in the fridge for 5 hours the day before. It was still slightly frozen, but it made it a really nice cold treat. Everything held in the right shape and the chocolate held up just fine being frozen. Thanks so much for your feedback, Ashley! So thrilled to hear you and your guests enjoyed the tart. I made this for Christmas and it came out incredible! I used a regular pie pan, increased the crust to 1.25 of the original recipe (my pie pan was bigger than 9”) and I doubled the recipe as someone people noted in the comments. This is really a show stopper! Bravo. So thrilled you and your guests enjoyed it Tracy! Such a lovely recipe! Super easy & Delish! We’ve made it in a 7″ & 10″ spring pan… Works equally as well. Drizzled white chocolate on top super beautiful dessert. So thrilled you enjoyed the tart, Trish! Love the white chocolate addition. Thanks for your feedback! Hi-So I’ve gone through all the comments and haven’t come across any definite substitutions for almost flour. Both my kids have a nut allergy and I was hoping someone had success so I could make it this weekend. Hi Sara! You could grind some sunflower seeds until it’s a fine meal to use in place of the almond flour as a nut-free alternative. Hope you enjoy! This recipe looks so beautiful that I decided to make it for my friend’s birthday party…….what I have found so far: the crust amount is not enough to go up the sides of the tart pan and the filling amount barely filled the crust…quater inch at most, so I’ve made another batch and poured it on top-kept the tart in the fridge in between….still not quite full, but definitely looks more impressive! I will bring it this evening and I’m sure it’ll be tasty…hope it slices well!….thanks for posting and I will be happy to give feedback after we slice it this evening! Hi LuAnne, did you use a larger sized tart pan than called for? That seems like what might have happened, because the recipe should fill up the tart pan, but wouldn’t do so if it was an inch or two bigger. Glad you were able to fix it though, and hope it’s a hit at your friend’s party! Can it be coconut flour instead of almonds? Coconut flour doesn’t work quite the same way as almond flour does, as it’s much more absorbent. If you were to use coconut flour instead, you’d want to use 1/3-1/2 of the amount called for. I am making dessert for a friend who is dairy free and gluten free. She doesn’t eat chocolate but is okay with cocoa desserts. Is there any way I can still make this dessert? Hi Harry – cocoa is a kind of chocolate, so not sure what she means by that…this is a very chocolatey dessert, so wouldn’t be best for someone who doesn’t eat chocolate. Can I use cocoa powder for the filling instead of melted chocolate? No, it won’t be the same at all – that would end up like chocolate milk! You could try using this chocolate fudge recipe but you probably won’t need to use it all to fill the tart. Can I use regular flour? My daughter in law has a nut allergy. I made this for a dinner party that included folks on strict gluten, dairy and egg-free diets. It was incredibly easy to make, looked beautiful and tasted so good. Even the guests without dietary restrictions were loving it. I will definitely be making this again! Hi there, unfortunately, coconut flour doesn’t substitute well for almond flour because it is MUCH more absorbent and in this recipe, there wouldn’t be enough bulk to fill the pan with 1/3 less of the amount of flour. You could try using oat flour instead, though! Does anyone know the shelf life of this tart if covered and refrigerated? Hi Jaimie, it will probably last about 4 days (the raspberries will go bad before anything else does) in the fridge. It’s best enjoyed soon after making for the freshest berries :) enjoy! Question: Can i make in advance and freeze? Is it possible to make in advance and freeze? Hi Betty – I wouldn’t recommend it because the raspberries wouldn’t be as great once they were frozen and rethawed. This was so decadent and delicious! My whole family gobbled it up. I did make an adjustment and back accident it turned out to be a good one! We were out of cocoa powder but had dark chocolate (85/15). So we ground up the dark chocolate in the food processor and used that instead of the cocoa in the crust. It was drool worthy! Ooooh that sounds heavenly! So glad you and your family enjoyed it, Emily! Thank you and Happy Christmas from a fellow Mediaviner! Just made this for my wheat intolerant son for Christmas day. Looks like it’s come out beautifully! Just made this – also made it last year. Filling isn’t as high as your picture though. Think my tray must be too big – I should have made twice the filling! Just measured it… it’s 28cm in diameter, or 11 inches, so think I made a boo boo with the tart container. Hi Keely, those 2 extra inches of diameter almost double the surface area, so it would definitely be thinner with a much bigger pan. I would’ve recommended doubling or 1.5xing the recipe for that size pan. Hi! This may be a silly question, but does the coconut milk give a significant coconut flavor to the tart? This sounds amazing and I’d love to bring it to my family’s New Years celebration, but my sister’s boyfriend isn’t a big fan of coconut. Hi Nicole, I think the chocolate overpowers any coconut flavor – I don’t notice it, but if you’re hypersensitive to coconut flavor you might. Hope this helps!